What can you do if you’re simply stuck? While driving after sunset on the sands of a South Padre Island beach, my friends and I got stuck in a rut and couldn’t get out. Ironically, the same thing happened to them a week before in the same pick up truck to the tune of a $135 towing bill. I was real clear I didn’t want that drama to be part of my vacation experience. So, I shifted my attention from the emotional situation to the result we chose and surrendered it to the Divine. It was essential not to get pulled into the swirling, chaotic energy that was building. I quietly asked for all the help I could think of, celestial and physical, with consistent focus and confident prayer. Over 25 minutes and as the night sky darkened, more than 20 people gathered to assist, but the wheels spun deeper until they disappeared into the hole. However, someone happened to drive by who had towing capabilities and easily pulled us out for free. That’s faster than the time it would’ve taken if we called for a tow. TIP #4: Prayer works. Ask knowing your requests are heard and answered in divine right timing. Think about it. Help just happened to appear. Likewise, in spite of whatever drama you may be in, there IS an equivalent of a tow truck waiting to help if you ask, trust and are open to receive. Miracles happen, and yours might come from a change in perspective. The fastest way out of a hole is to stop digging. You can choose something different. You can choose to let go of judgment and fear. You can choose to trust and be open to receive. You can get out of any rut in your life. If you don’t want to wait until you’re hanging off a cliff before you let go (only to discover you’re just a few inches off the ground), here’s a tool to overcome procrastination and propel you to take action. PARTNER by contacting a trusted friend or co-worker who has a project to complete, too, for an Accountability Sandwich. What’s this? It’s a technique to receive support to take action. For example, one person may want help to focus on cleaning the desk and another on doing a task. Set a time in advance to contact each other by phone or email to start your projects. Contact each other at that time. The purpose is to say a quick hi, specifically state what you plan to accomplish and set a time to check back. Take action on your project. Check back at the appointed time with your updates by phone or email. If you’re incomplete, set another time to do the work and check back. Once I organized my office, in spite of watching TV and taking a nap after the first call. I wasn’t about to report I gave up so, with a late start, I took action. Momentum kicked in before the second call. Although past the check in time, I enthusiastically accomplished my goal by night’s end. TIP #3: Stop trying to do everything yourself. Ask for and receive quality support through PARTNERING by using an Accountability Sandwich, a technique that’s fun, inspires action and works. Sometimes we can’t make peace with ourselves, no matter what. We hold on tight to our fear and anxiety as long as we can, in spite of our best intentions. However, cliff hanging makes us prime candidates for an eleventh hour save. That’s exactly what happened to me. For weeks I simply couldn’t create a workbook for an afternoon workshop. Finally, I gave up trying. I’d go without. Only after thoroughly letting go, literally at the eleventh hour the night before, I started to write. A 19 page book flowed out of me. I wrote all night and, with no sleep, still felt energized to give and enjoy the workshop, too. But what I put myself through beforehand! TIP #2: Choose to let go. If you hold onto your fear and anxiety, you’ll block your flow. If you have whatever it takes to move forward at the eleventh hour, you probably have it before then, too. You can choose to let go of the pressure earlier, and save yourself from useless agony and guilt. If you choose, you can get out of the habit of eleventh hour saves. Have you ever had a deadline or goal but felt stuck and simply couldn’t take action? Maybe you were “shoulding” on yourself and immobilized from your mental tyranny. In August 2001, every day for two weeks, I sat in front of my computer to write a seminar…and not one word came. Nothing. I put so much pressure on myself that I stifled any creativity to write. Eventually, I listened to what I was telling myself: I should’ve already done this, and I should’ve done it years ago. I made peace with the situation by shifting my perspective from feeling “resistance is futile” to: I am where I am, and from here I will start. Over the next four months I wrote a 60-page workbook… and then, because it became so big, I didn’t know what to do with it. After all of that work, it sat on a pile. Fast forward seven years. 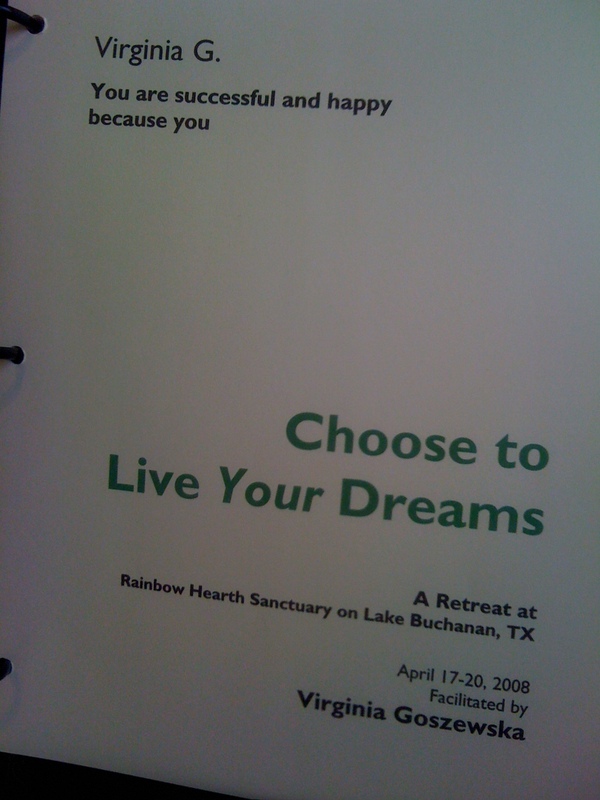 I remembered the workbook when I discovered I didn’t like a manual for a four-day retreat I was to facilitate. Oh, did I mention it was less than a week away? The workbook was a key for breakthroughs and fun throughout the event and saved me from being in another writing rut. TIP #1: Stop shoulding on yourself. Self-judgment holds you back. Like it or not, this is where you are, so make peace within by allowing you to be in the present moment. When you accept yourself and your circumstance, you let go of the shoulds, pressure and negative self-talk. Then any small step will get you started. When this happens, you get out of your rut and pave the way for momentum.